Many people have asked us to make a detailed video about our Go Box, so we decided to make one. We show you what is in the Go Box and how we installed all of the equipment. There is also some funny stuff in the video, too! These girls do an amazing job with the video–bravo! I love this setup. While I typically pack very lightly for portable radio work, building a system like this makes for very quick deployment when you require a full 100 watt system with multiple radios and multiple accessories. 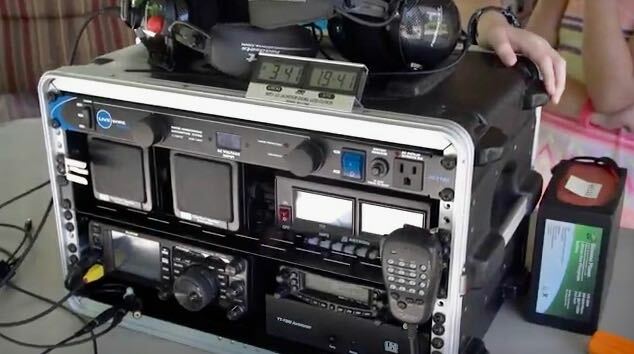 Radio clubs could easily put systems like this together for events like Field Day or Emergency Comms. It’s grab-and-go at its best! Of course, a field DXpedition/SWLing station could also be easily built into this portable system. In fact, I bet an SDR with computer, keyboard, and monitor could be mounted and accommodated in this space. This entry was posted in Ham Radio, News, Portable Radio, Shortwave Radio and tagged Emergency Communications, Gator Cases GR6S, Go Box, Go Kit, Ham Radio, Portable Radio, Portable Shortwave, Southgate ARC on July 15, 2017 by Thomas. I am a ham KJ6ZLL I would like to build a go box for my radio equipment . Where did you get the the box? Do you know someone who could help me build a go box. Or call my cell phone 1(909)380-3422, giving me the information I need or someone who could build it for me. Great concept and an ever greater presentation. You “kids” exhibit a good deal of technical knowledge and understanding at such a young age – maybe you had a good teacher (thanks Dad…). Congratulations to all of you. Did you have any concerns about equipment cooling inside the cabinet ? It is open to the front and back(?) while in operation, but did you take any temperature measurements to be sure everything stayed cool enough ? Any thoughts about adding a muffin fan ? I might be inclined to tilt the case up at a slight angle for easier access to knobs and better visualization of the screen. Does this case configuration work “as is” or do you prop up the bottom front of the case ? And finally, after all is put together, how much did this fully stocked case weigh ? Again, a fine piece of work and presentation you all have done here. Beautiful, a radio work of art. All self-contained, well constructed, laid out nicely. Reminds me of the older IFR service monitors. Nice work, well done! When it comes to go boxes, there are two basic philosophies: disposable and valuable. This particular go box is of the valuable variety – it has multiple radios, seemingly does everything one would presumably want it to, and represents a significant investment by the builder. That’s great, and it’s perfect for certain types of deployments – field day, pubic/special event station, extended field operation, etc. These are typically very heavy and require two people to safely transport it should the need arise. The other type of go box is the the disposable one, one designed to be used in emergency settings, where the operator may be forced to leave at a moment’s notice and without giving the radio a second thought. These are typically older radios, maybe just one radio, and a power source. If need be, it’s small size and light weight allow for quick removal by one person. Both go boxes have their uses, it may serve an individual or club to have both.